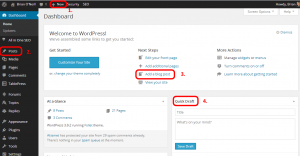 There are several ways in WordPress to create a post. In the screen-shot you can see the main ways to create a post and listed below are the steps used by each option to get you to the main "Add new post" screen. Using option 2 you can hover over the Posts item on the menu on the left, this will cause a fly out menu to appear as shown in the image. If you click on the Posts option the fly out menu will appear below the Posts. Using option 3 on the dashboard will take you directly to the Add New Post window where we are going right now. There are two ways to enter text in this window, the two tabs on the right for Visual and Text allow you to switch from entering the text and images and formatting the post using the formatting menu at the top, this is commonly know as a WYSIWYG (What You See Is What You Get) screen. Alternatively if you know HTML then you can click on the text option and type in your code. For now we are going to be working in the Visual window. What the blog is about? How you think it will help them. How they can interact with you on the blog. Saving and publishing your new post? At the very far right you have the saving and publishing options along with the options for how you want the post to be displayed - this options' display is controlled by the theme you are using, and the options for what you want to categorise it under and tag it under. You will want to use the Save Draft option while you are building the post encase you want to change the name of the post to something else - for your first post you could just go with "Hello" or "Welcome to the blog". Also if you don't continue to use the save draft and your system goes down for some reason you will lose all your work. When you have finished your post and have previewed it and it looks the way you like then you can publish it by clicking to the Publish button. Publishing at a later date If for some reason you want to publish the post later you can click on the Edit on the "Publish immediately" option and you will be given the option to input a date and time option for the post to be published. If you clicked on the edit button and are not ready to publish the post then just click on cancel and you will be back editing the post. If you have your Welcome post finished then it is time to publish it for the world to see, go ahead and click the Publish button. Hey presto you have a post up on you blog. The post will be published and the system will tell you "Post published. View post" Click on the View Post to be taken to the blog fully loaded with your first post.